28 D I V E R S I T Y W O M A N W i n t e r 2 0 1 8 d i v e r s i t y w o m a n . c o m and marketing, made changing the hide- bound nature of the academy one of her priorities, starting with diversification of the more than 6,500 members. When she became president in 2013, the mem- bership was 93 percent white and 76 per- cent male. In 2016, in part as a response to the #OscarsSoWhite backlash, Boone Isaacs kicked into high gear an initiative called A2020 (which had already been in the works) with the goal of significantly increasing the representation of women and people of color in the 17 branches of the academy by 2020. So far the initiative is slowly and steadily working—from 2015 to 2017 the percentage of women in the academy increased from 25 per- cent to 28 percent, and the percentage of people of color grew from 8 percent to 13 percent. 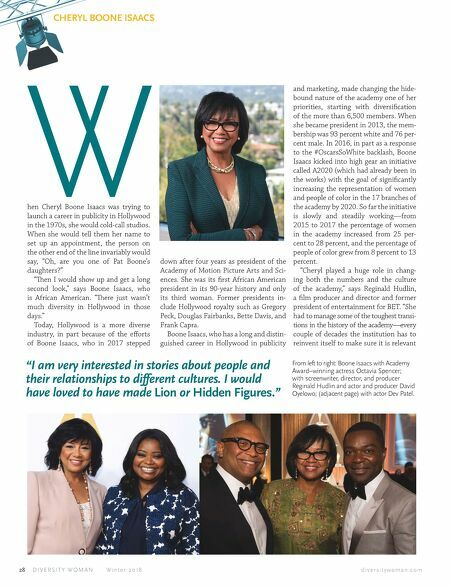 "Cheryl played a huge role in chang- ing both the numbers and the culture of the academy," says Reginald Hudlin, a film producer and director and former president of entertainment for BET. "She had to manage some of the toughest transi- tions in the history of the academy—every couple of decades the institution has to reinvent itself to make sure it is relevant hen Cheryl Boone Isaacs was trying to launch a career in publicity in Hollywood in the 1970s, she would cold-call studios. When she would tell them her name to set up an appointment, the person on the other end of the line invariably would say, "Oh, are you one of Pat Boone's daughters?" "en I would show up and get a long second look," says Boone Isaacs, who is African American. "ere just wasn't much diversity in Hollywood in those days." Today, Hollywood is a more diverse industry, in part because of the efforts of Boone Isaacs, who in 2017 stepped down after four years as president of the Academy of Motion Picture Arts and Sci- ences. She was its first African American president in its 90-year history and only its third woman. Former presidents in- clude Hollywood royalty such as Gregory Peck, Douglas Fairbanks, Bette Davis, and Frank Capra. Boone Isaacs, who has a long and distin- guished career in Hollywood in publicity CHERYL BOONE ISAACS From left to right: Boone Isaacs with Academy Award–winning actress Octavia Spencer; with screenwriter, director, and producer Reginald Hudlin and actor and producer David Oyelowo; (adjacent page) with actor Dev Patel. "I am very interested in stories about people and their relationships to different cultures. I would have loved to have made Lion or Hidden Figures."